It's been an Excellent Adventure indeed! 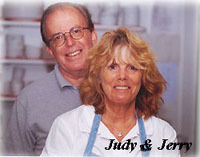 Those letters stand for Judy & Jerry's Excellent Adventure! and now it's time for our next ADVENTURE . . .
Our bittersweet news is that we closed the Wiley Inn for business on October 11, 2011. We enjoyed close to 18 years of being the Innkeepers and owners of the Wiley. When we found the Inn in 1993 it had been closed by the prior owners at the end of fall foliage season. just as we did in May of 1994. The Wiley has been in operation since 1943 and it will be back! We hope you will be too. FYI: Yes, we are heading south in our wonderful RV. Our cell number will still be 802 375-4550. When we locate we may be in touch to tell you where the rolling stones have landed. As you can see, for now we are keeping our WEBSITE & the links that you still see. We hope you will enjoy these memories (as we do) and keep in touch too. our new adventures as "Wiley on the Road"